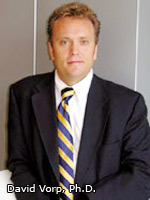 Dr. David Vorp is an Associate Professor of Surgery and Bioengineering. He is also the Director of the Vascular Surgery and Vascular Biomechanics Research Lab. His research focuses on the assessment of mechanical factors in the genesis and progression of vascular diseases such as arterial aneurysms, atherosclerosis, vascular graft failure, etc., and in the development of tissue-engineered blood vessels. Dr. Vorp also describes some of the new initiatives of his lab such as the use of tissue engineering to treat urethral dysfunction. On the podcast, Dr. Vorp introduces his innovative approaches to treat vascular disease and shares the status of these emerging technologies. He also shares his insights on Bioengineering education at the University of Pittsburgh. For more information on Dr. Vorp, please click here.